The Timorese people dreamed one day that they could be free and independent, and, in fact, that dream has come true. The Timorese now dream about national development. They dream about having a stable and safe country; they dream about a prosperous and just society; they dream about better living conditions and an economic growth which may lighten their poverty. The Government, of which I am honored to be the leader, is constituted by men and women willing to convert these challenges into peace and development opportunities. This commitment to development is based on three fundamental elements of governance: Dialogue, Trust and Strategic Vision towards the future. To govern in Dialogue with the political parties, the economic agents, the civil society, the citizens and, of course, the other Organs of Sovereignty. The Government expects the constructive participation of all in the development of Timor-Leste. To govern in Trust, based on the values of civic and human rights, on tolerance and respect, on the principles of good governance and transparency, and on the obedience of all to the Law. Trust consolidates Democratic Institutions and allows the fulfillment of their mission, while being responsible for promoting stability, unity and welfare in Timor-Leste. To govern with a Strategic Vision, by investing in human resources, infrastructures, agricultural and rural development, private sector development and in the promotion of external investment. 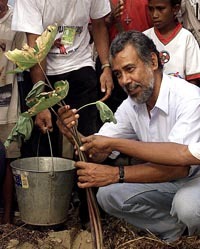 Only vision allows us to develop an economic growth policy which favors the creation of job opportunities, income increase and the reduction of external dependence of essential goods, while improving the essential services rendered to the population and managing the natural resources of Timor-Leste in a wise and reasonable way. By greeting you here, it is my purpose to report on our responsibilities and commitments, but it is also our wish to be closer to the People, in permanent consultation and dialogue. Timor-Leste, a country where dreams are possible!